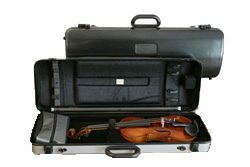 The lightweight case for high-value instruments: 2.2 kg. Dimensions: approx. 15 x 28 x 82 cm (HxWxL). Highly stable despite its low weight. Available with or without music pocket.